I was at the store the other day, in the school supplies area, because my children have a strange obsession with school supplies during any time of the year. My oldest two, who are now teens, were obsessed with binders for years. They will deny it now, but when they were tweens, they both loved office supplies more than any person I’ve ever known. While we were stocking up, I found this new Elmer’s glow in the dark glitter glue. They only had one color, but I see it comes in multiple colors now. This stuff is awesome. It glows super bright in the dark. In fact, I made our slime and then set it under a lamp for just 2-3 minutes and when I turned off all the lights it was GLOWING SO BRIGHT! 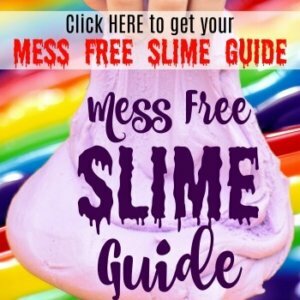 We had just watched an alien movie a few days ago, and I thought wouldn’t it be fun to turn that glow in the dark glitter glue into some alien slime. 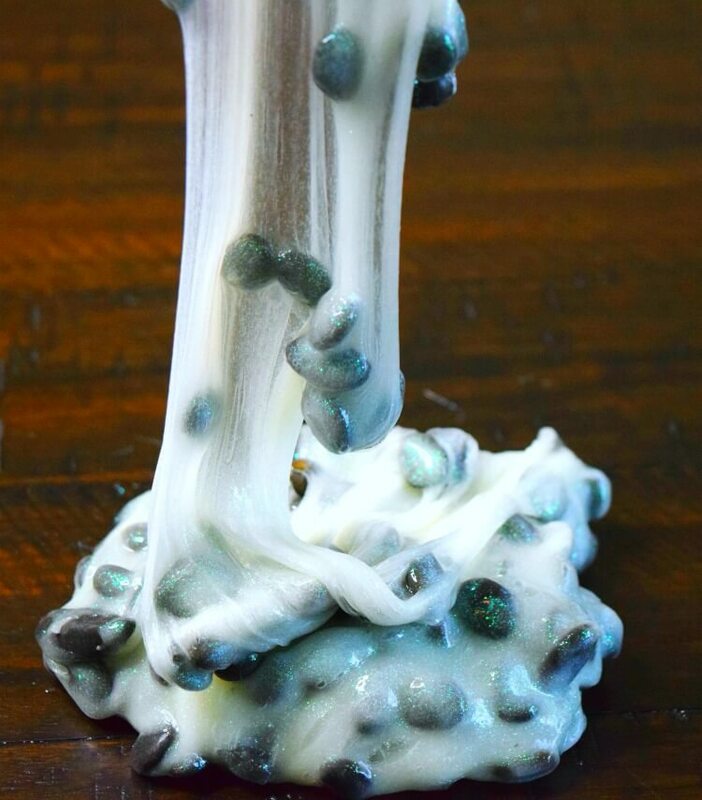 It needed to be some kind of freaky alien slime. As I was gathering supplies, I saw this bag of black pebbles I had picked up at Dollar Tree. 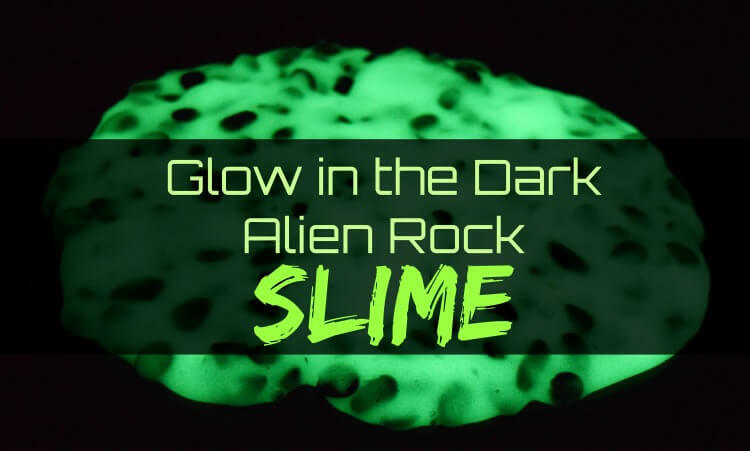 That was it – Glowing Alien Rock Slime! Combine the glue and water and stir. Next, add the bag of black pebbles. Pour in the liquid starch and stir. Once it turns from liquid to slime, begin kneading the water out of it. If it continues to feel too sticky after a few minutes, add just a little bit of liquid starch and stir until the slime becomes more solid. Then, it’s time to play with it immediately. It’s a great sensory activity, especially with the added texture of the pebbles. It’s also great for play with your favorite action figures or dump trucks…or whatever! Want some glow-in-the-dark play? 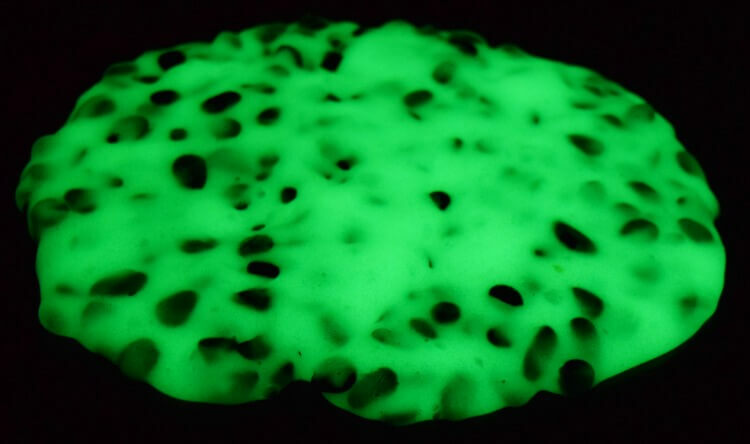 Just set the slime in front of a bright light or window for just a few minutes and it will glow for a long while. Just 2-3 minutes in a light, kept it bright and glowing for us for 30 minutes.